As we approach CSA basket time, I am trying to clean up everything I froze last summer. We had lots of zucchini, which we all know makes great bread. I wanted something just a little different than traditional zucchini bread. 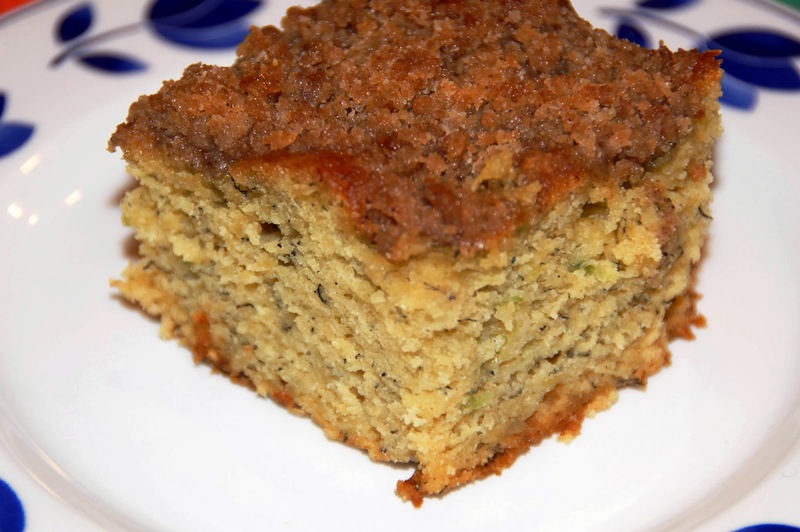 With a couple of overripe bananas on the counter, I wondered about zucchini and banana bread. With a search, I found this recipe. Since frozen zucchini is pretty wet, I was concerned about this bread baking evenly. Why not make a cake instead of a bread? I am so glad I did, this was a moist and delicious cake. Pre heat oven to 350 degrees and grease a 9x9 square pan. Set aside. In a large bowl, mix together 1 1/2 cups flour, baking soda, baking powder and salt. In another bowl, beat together bananas, zucchini, sugar, egg and melted butter. Stir the banana/zucchini mixture into the flour mixture just until moistened. Spoon batter into prepared loaf pan. In a small bowl, mix together brown sugar, 2 tablespoons flour and cinnamon. Cut in 1 tablespoon butter until mixture resembles a coarse crumble. Sprinkle topping over bread. Bake for 50-60 minutes or until an inserted toothpick come out clean. Allow cake to cool before serving! Very clever use of your freezer items. Zucchini is the best thing, last summer I worked it into just about everything. Love this little cake! It does look super-moist and delicious! Zucchini always makes things moist and adding the banana would make it even better, and a great way to get a veggie! Sounds wonderful. I love putting zucchini in my baking! You know how I am always on the hunt for anything banana and this looks super yum! Hope you are enjoying Spring. I always wonder about storms your way and hope you and your family are doing well. Hugs from Idaho!!! !